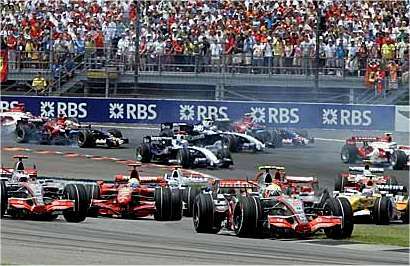 The press were delighted with Alonso's sudden swing towards the pits on the lap following his failed attempt to get past Hamilton - more fuel for their guesses at needle between the McLaren drivers, of course. The really silly thing about all the speculation is that it is true in essence and would be strange if it weren't. Put yourself in Alonso's place: two world championships (both of which he had to work hard for and beat Raikkonen and Michael at the same time), he takes an enormous chance in moving to McLaren (desperately non-competitive in 2006), gets lucky in that the MP4-22 turns out to be a winner, and then suddenly his rookie team mate starts beating him. Wouldn't you be a bit miffed too? The point is these are racing drivers and their aim is always to be the best, therefore. They have to believe in their abilities or they wouldn't be in F1 at all and so it is perfectly natural that each of them will find reasons why their team mate beats them, if it happens. That is necessary for the preservation of the psyche. But the assumption that the drivers must hate each other as a result is going too far. That ignores the fact that they have to work together if they are to remain competitive against the other teams. And so most drivers explain their losses to themselves (perhaps with occasional unwary comments to the media) and then get on with the job. It is rare for team mates to become so antagonistic that they start pushing each other off in the races - that helps neither of them. It seems to me that Alonso is handling the situation at McLaren entirely in character. He had his moments of petulance last year when Renault were handicapped by the ban on mass dampers and it is only to be expected that he will not enjoy seeing Hamilton taking the top step of the podium from him. Remember that he also seems to have the ability to forget all that when in the car, however. His performances against Michael in the final races of 2006 were masterful, devoid of any indication of nerves or immaturity. He has pressed on in adversity before and can do it again. Of course, the media (and Alain Prost) would like these signs of tension to indicate a war developing inside McLaren - there is nothing that sells newspapers better than conflict. But they overstate their case. There is some tension, understandably, but Ron Dennis will keep a tight rein on it and prevent things getting out of hand. It's what he does, after all. Ferrari has a similar problem but it is just one of several. Their chief concern must be that the car is no longer the best and they are losing ground to McLaren. Whether or not this is a result of the dispersal of the dream team of previous years is a debatable point, but the fact remains that the present team has to deal with it. Time will tell whether the tweaks in the pipeline can get the cars to the front again but I doubt it - every team has new bits to add and should improve. The season begins to look like one of those McLaren steamroller jobs. Although I had thought Fernando Alonso had coped remarkably well with Lewis' arrival and the press stupidity, the swerve in the middle of the race made me change my mind. Fernando can be a bit temperamental in the car without it affecting his speed or judgement, but he usually saves his incidents of temper for when he can get the message across most forcefully. Since wing mirrors are not that good in F1 cars, I doubt Alonso could have been aiming the message at Lewis, and I have never seen him fall out with his engineers on-track before. The incident didn't seem quite in character. Clearly he doesn't hate Hamilton (he's not that sort of driver), but he is looking very frustrated at his current situation. Since the McLaren is nowhere near as tolerant of aggressive driving as the Renault used to be, this will probably hamper Alonso's efforts to defeat Hamilton. I agree that Alonso's swerve at Indy was probably the result of sheer frustration, Alianora, but suspect that Alonso has more determination than might appear from that. He will know that the only way to beat Lewis is to start qualifying ahead of him (the one who leads at the second corner wins the race, as Number 38 says) and he will concentrate on that now. From what i've read it appears that Alonso is being asked to refrain from pushing Hamilton too hard once a lead is established. This makes sense as you don't want your drivers accidentally taking each other out of the race as they strive to win. However, once the constructors championship is won will Mclaren take the gloves off and let the lads fight it out properly? It could certainly liven up the end of the season. I think McLaren's instructions to their drivers are probably the standard ones, Keef: you may compete for the lead but not to the extent of pushing each other off. These days, that's as good as saying, "If you haven't passed the other guy by the second corner, forget it"; it is impossible to pass in modern F1 cars without risking contact. So the pit stops and strategy become the only possible overtaking points - and McLaren seem to me to be absolutely even-handed in their handling of these. The idea that Ron might allow them to fight after the constructor's championship is in the bag is an interesting one, although I don't think it would make much difference. Both drivers are very good at offering no overtaking chances at all. I agree about the instructions being standard, but there's always some outcry from the press every year about 'team orders' and i understand that this year is following form. Now Ron Dennis (never trust a man with no discernible surname, wouldn't you agree Mr Allen?) is a racing man at heart and i think he will rescind the orders at the close of the season to put to bed the accusations levelled at the team regarding the orders and favouritism from the pits. It's one thing to ask a team mate to think of the team, but it's something else to ask a world champion to relinquish a title when it is the only thing left to race for. And whilst both drivers are capable of defending a lead, Alonso is certainly adept at taking it. But it may just be wishful thinking. The press are only interested in the team orders thing when it affects one of their favourites. They created the pressure that made the FIA bring in the rule about team orders in the first place and it is proving unworkable - where does strategy end and team orders begin? It has to be a matter of opinion and any rule that relies on opinion is a bad rule. I agree that, of all the team bosses, Ron is the most likely to allow racing between his drivers once the team's requirements have been met but am not so sure that Alonso will be able to pass Hamilton in a fair fight. When cars are equal, there is very little the drivers can do to make a difference. Look at the way Raikkonen hauled in Massa in the final stint at Indy but never managed to get past him. He was obviously faster but still not fast enough to create a decent overtaking chance. There has to be a big difference in lap times these days for a pass to be successful. I had not intended to imply that Fernando wasn't determined - frustration and determination often do co-exist simultaneously, albeit uncomfortably - but I don't think that on its own is going to be much help if he's getting overly frustrated with the situation. Hopefully he will come to terms with the fact that F1 cars in the modern era do not exactly encourage overtaking (though several drivers in the mid-field were doing their best to contradict that at the US GP!) and do as Clive suggests in comment 4, which is to say improving his qualifying and starts. Doesn't say much for F1 when the whole race comes down to how well you did on your last lap in qualifying, does it? Nope! Especially when it takes an hour of laps (where only the final lap each driver does in each session is usually relevant) to determine that qualification position. It's a three-lap race, with the first two being only to avoid removal from the reckoning (which the McLaren and Ferrari drivers generally manage with ease).